20-09-45 - The Coleman Brothers (Decca 8673). This number was used in Elvis's film Frankie and Johnny, with composing credits going to David Hess (?1936-2011). It was the first track recorded for the film. However, the tune seems to be the same as an older number called "Gonna Raise A Ruckus Tonight," or "Gonna Raise Rukus Tonight," or some other similar phrase involving a ruckus (with or without a "c"). 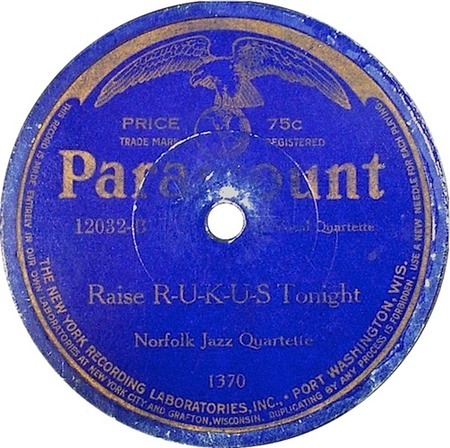 The earliest recording of a variation of this number was made by the Norfolk Jazz Quartette, titled "Raise R-U-K-U-S Tonight" was released on Paramount 12032 in 1923. The melody is probably still older, however, and can only be indicated as "traditional." Robert Emmett Dolan arranged the tune and Johnny Mercer provided the words to create "We'll Raise A Ruckus Tonight" which was finally published in 1934 (this is getting complicated!). How similar the words in Elvis's version are to the "original," I have no idea, but the phrase "gonna raise a ruckus tonight" is still there! David Hess? Well, he wrote several numbers for Elvis, including "I Got Stung" and "Sand Castles." Using the name David Hill, he also recorded the original version of "All Shook Up."